TECA’s Associate Member program is your connection to the electric cooperatives of Tennessee. Associate Members are given exclusive access to co-op decision makers, priority opportunities to promote your business through advertising, onsite meetings at our office, directory listings and your company will receive special recognition during our events and conferences. Associate members are invited to participate in our summer managers’ conference held each year in June, giving you the exclusive opportunity to spend valuable time with our system managers. Associate members also receive a subscription to The Leaders’ Letter, our monthly newsletter featuring industry and legislative updates and the latest news from our co-ops. 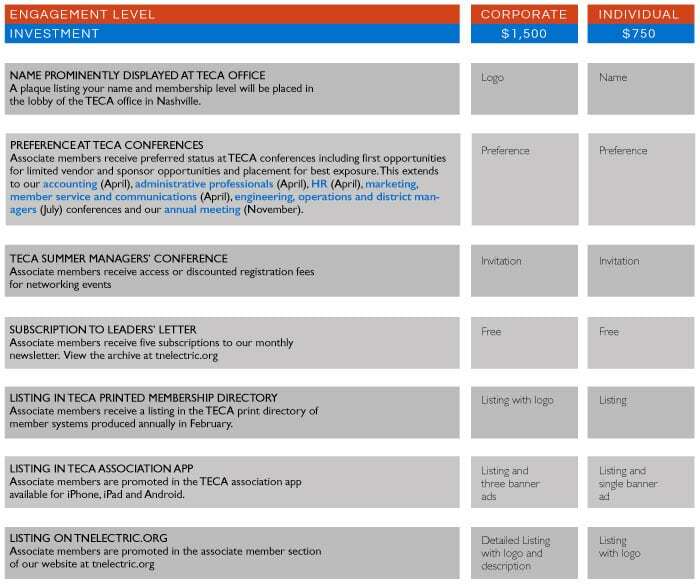 Associate members are listed on our member wall at the TECA office in Nashville and in our annual printed membership directory, the TECA app for iPhone, iPad and Android and at tnelectric.org.